Review Board can integrate with various third-party services to connect your workflow. 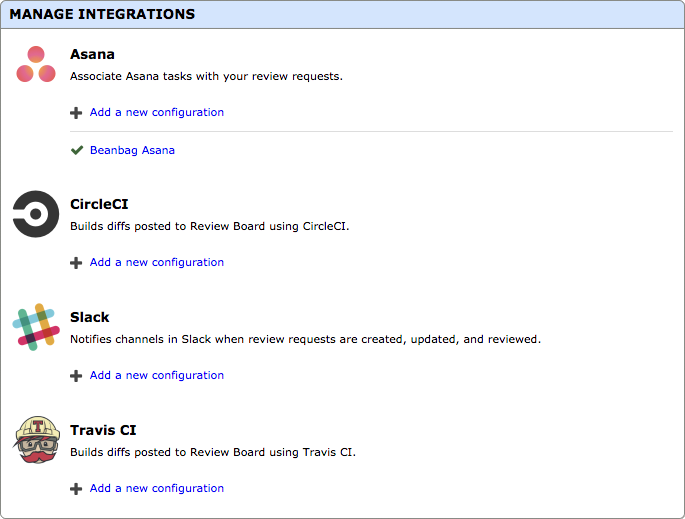 Several integrations are built into Review Board, and others can be provided via extensions. The Integrations page in the Administration UI lists the available integrations. Each integration may have multiple “configurations” that run based on a set of conditions. This allows you to do things like have messages sent to different channels on a chat service based on the groups involved. To create a new configuration for an integration, click Add a new configuration. Additional integrations may be provided by extensions.